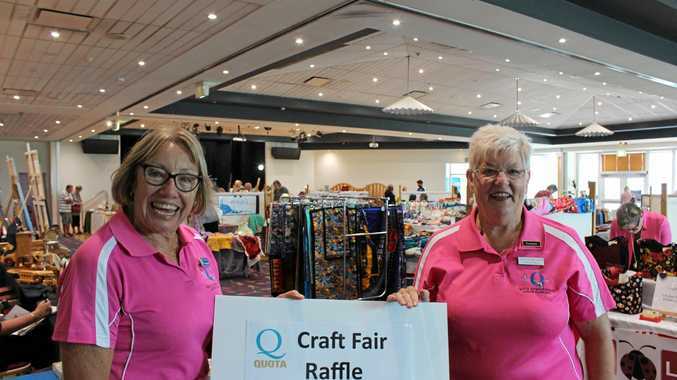 CLARENCE Art, Craft and Garden Fair at Yamba showcased the wares of local creative producers with the aim of fundraising for various groups in the community. "It is our biggest fundraiser for the year,” organiser Dianne Wilson said. The fellowship and friendship that comes with being part of Quota was a key attraction for many of the members, who meet regularly to socialise and organise. "I moved to the area and was looking for something to do and I found that I really enjoyed the company of the ladies in the group,” Ms Wilson said. Liz Watkins and Brian Thomas were at the event showcasing jewellery, gems and children's favourite, dinosaur poo. "The technical term is coprolite,” Ms Watkins said. Despite being millions of years old, Ms Watkins was constantly amazed at how people handled the rock. "The number of times you see people surreptitiously wiping their hands on the side of their trousers,” she said.